Where are you? Home > News > Rhythmtree Festival home and dry with new lineup and new dates! The Rhythmtree Festival has risen from the proverbial ashes - or in their case, the floods - that postponed their original July dates with the announcement of a special one-off festival on the 24 - 26th August 2012 (Bank Holiday weekend) and a lineup that includes as many of the rescheduled artists as possible along with some great new acts! If you've never heard afrobeat then you're in for a real treat - a complex blend of highly danceable funk grooves, traditional Nigerian music (including Hi-Life) and African percussion underpinning jazz horns, rhythmic singing and some great solos. 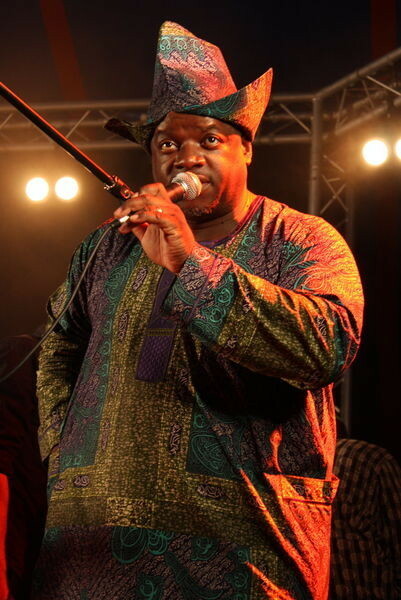 Also, just announced is the booking of the Malian guitarist Vieux Farka Toure (son of Ali Farka Toure) and his band for the main stage - often referred to as the "Hendrix of the Sahara". His third album "The Secret" (featuring the last performances of Vieux and his father) was released last year and was well received. This year he has also started a collaboration with Israeli songwriter Idan Raichel with a band called the Touré-Raichel Collective. The festival is worth attending for these two African heavyweights alone. However, it's also definitely worth checking out the Friday night headliner Skip "Little Axe" McDonald (another WorldMusic.co.uk favourite!) from the USA. Skip and his band perform a mixture of blues, jazz, gospel, RnB and dub - although he initially cut his teeth on early rap working as a session musician for Sugarhill Records - even featuring on "The Message" by Grandmaster Flash and the Furious Five! In another recent announcement is the news of the booking of bands Kishon Khan's Lokkhi Terra and Wara bring some Asian and Latin fusions to the mix. Both of these bands again come recommended by us. Amongst the packed line-up are also the Ukrainian singer-songwriter Iryna Muha, The Ouse Valley Singles Club and award-winning Cajun band Colin and the Crawfish. More new acts are being announced all the time - so keep checking back for more details. The Rhythmtree organisers also have arranged for a special deal with the ferry service Red Funnel for cheaper ferry crossings for festival ticket holders - all in all a great package for a Bank Holiday weekend trip to the beautiful Isle of Wight for a fantastic world music festival at very reasonable prices, especially good for families. Three Gates Farm, Calbourne, Isle of Wight.